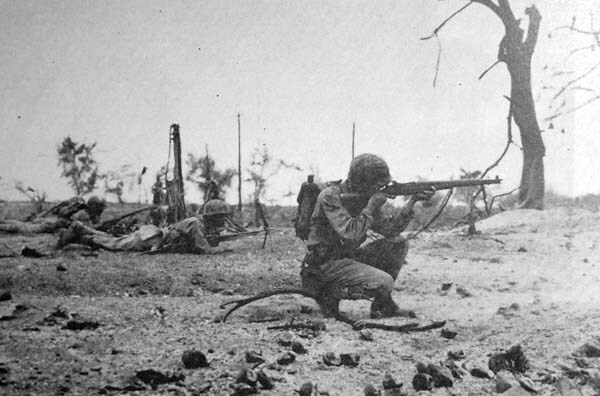 U.S. Marines on Peleliu. Belau National Museum photograph. With the end of WWII, Palau and much of Micronesia became the Trust Territory of the Pacific Islands (TTPI), a United Nations mandate administered by the United States. “It was hard because the Palauans had never seen the Americans. Japan closed access to this area around 1935 when they really began to prepare for war, so right then and there, no access. "The Japanese were the only people we knew, and naturally, you felt partial to them. Then somehow the Americans got word to some of the Palauans and the Palauans spread the word, ‘the war will soon be over.’ The Americans have taken Peleliu and Angaur. “So when the Americans first came and tried to get the Palauans out of the caves, we were very reluctant. But I guess when you can tell when someone is being kind or helpful to you. So it didn’t take long before we kids were on the side of the street waiting for these trucks full of Americans to come, throw chewing gum and chocolate bars and all of that. "Those early years with the Navy here, those were really good years." 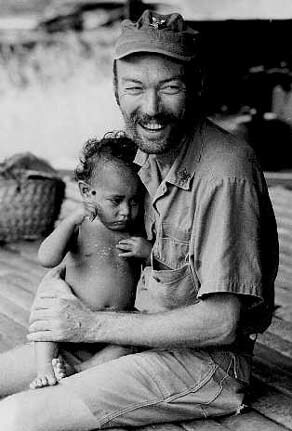 Seabee Gerald R. "Joe" Proebstel and child in Ngebuked, Palau, 1973. Image from the Trust Territory of the Pacific Archives. 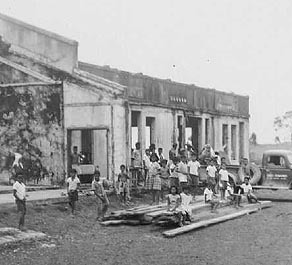 "Village children at Japanese era building, Airai." Photograph from the Trust Territory of the Pacific Archives. “In Airai too, there were a lot of houses that the Japanese built in areas over there, especially family cottages. You can still see the foundations, the steps to the houses, almost everywhere over there. You go into the forest, you see remains. We don’t have enough people these days to built to that extent, into those areas." These Japanese gateposts, in front of the Palau High School today, are all that remain of the building that once stood behind them. 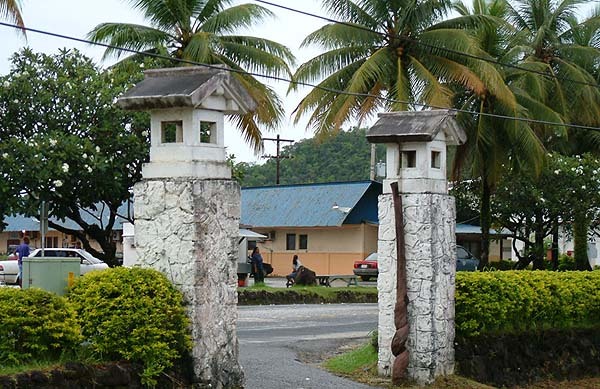 Such gateposts are still seen in several locations in Koror. "Americans, I think they could only do so much. They could just teach us how, and they didn’t come and force us to do what they want to do. The Americans gave us money and we used money to educate ourselves, get ourselves more advanced." “The first thing the Americans did was health care” Kathy states. “They get everybody examined and checked. Tuberculosis was big, and sores, ringworm and other big open sores probably caused by malnourishment. So there was a lot of medicine being passed out and examiners, chest x-rays and so forth." "And the next was education. School, schools came into being. Kids went back to school and started learning English, started learning arithmetic. And our teachers ironically would school in the Japanese tradition. 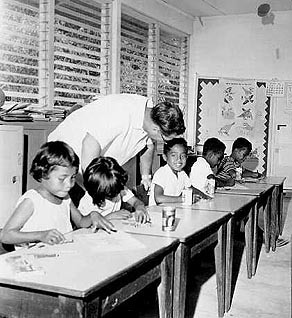 Our Palauan teachers were once schooled by the Japanese, so they knew the art of teaching, what classrooms should look like and how a teacher should function, but they were disciplined in the Japanese classrooms. "So they did the same things. In the early years, you would get punished for being late, and for tending? In class, and for not paying attention—standing in the sun, according to the stories. Nevertheless, school was on. Kids went to school five days a week, for nine months, and learned the alphabet and all of that." 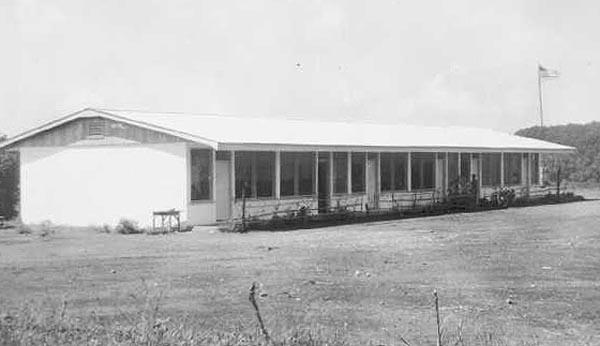 "MacDonald Memorial Hospital, Koror," ca. 1974. Photograph from the Trust Territory of the Pacific Archives. 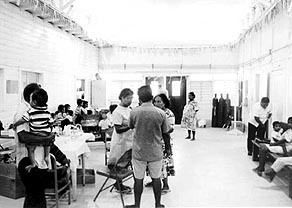 "Palau classroom with teacher and students, 1967." Photograph from the Trust Territory of the Pacific Archives. “This is all in English. The instruction was in Palauan, but the characters and numbers and so forth were in English and we did learn how to speak English by reading textbooks that were written in English. It was American education. There was public education and then there were the missionaries: Catholic, Protestant, Seventh Day Adventist—they all contributed to education." “There were contract teachers who came in before the Peace Core program started,” Walter recalls. “They’d come for two years. The TTPI built housing for the contract teachers in every state in the whole of Babeldaob. And after that the contract teachers came." 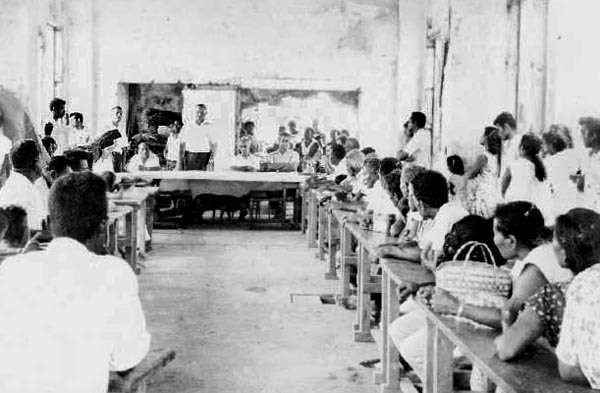 "Mr. Flakne addressing the Airai community in the old school building, Dec. 29, 1963." Photograph from the Trust Territory of the Pacific Archives. “The contract teachers usually came with families. Then they’d stay there for two years. It really improved things. Every Christmas, we would get a present from the school. It was a rectangular box with a red cross on it, probably from the Red Cross. It had tooth paste, toothbrush, pencils, rulers, all that kind of stuff, and it was a big thing you expected on Christmas. “That is when I was going to school— my six years in Airai. We had the first Peace Corps volunteer program. In those days we just used everything and learned everything American. Even the flags: we had American flags during TTPI time, until we became separate from them and wrote our own constitution. In those days we raised American flags. School was taught in English, but it was not a really good English. We were using Palauan English until the Peace Corps came, and then it really improved." “If anything, I’m really grateful to the American administration here for doing that,” Kathy says, “for thinking that education is the number one priority. I think it has helped the way this present generation regards themselves and the world and their community. "There’s a lot of them that think that we have adapted, by being associated with America, but the most fundamental concept of independent people, free thinking people was instituted in the beginning. And choice: the liberty to do what you want and can do. "I think that’s had a big impact on Palau, big impact on the way we see ourselves. Japanese never asked us what we want to be or who we want to be or where our place is going. They were not concerned with that. So I think that was really very good and it all came about through this emphasis of education." 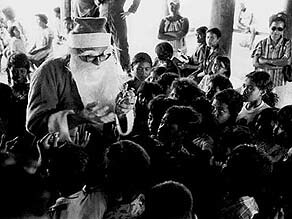 "Santa and children, Koror, Palau," probably 1970s. Photograph from the Trust Territory of the Pacific Archives. 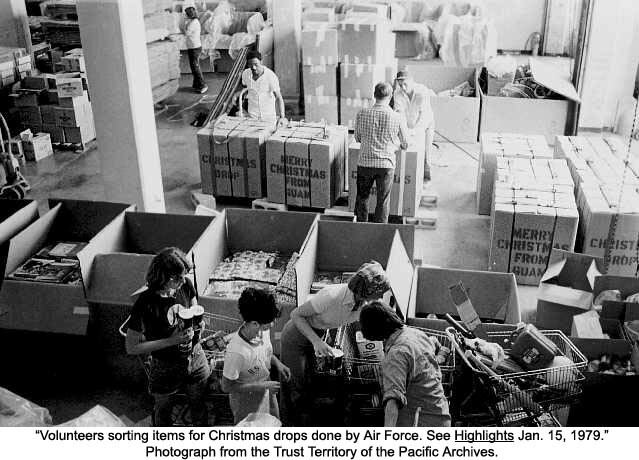 Click here to see an image of volunteers preparing the Christmas packages. 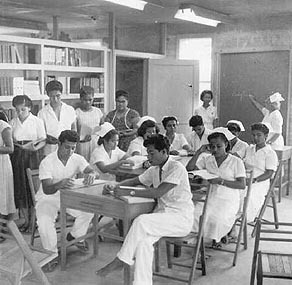 "Nursing School, Koror, Palau, Sept. 1955." Photograph from the Trust Territory of the Pacific Archives. “And the population was small. Right after the war, there were only 5,000 of us, whereas before we were doing about 20,000/25,000. After the war, they registered about 5,000 or so and then from 1947 up until now it’s been steadily growing. In the 1950s, there was only a handful of us, mostly young or old, very few in the middle because of the war. "Airai School, Nov. 22, 1964." Note the American flag. Photograph from the Trust Territory of the Pacific Archives. “Right after the War, there were a lot of Palauans that went to Guam,” Masaharu says. “Some of our leaders went to Guam for training, some became teachers, some became administrators. "T.T. 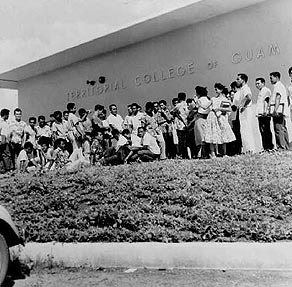 students at Territorial College of Guam, 1960/61." Photograph from the Trust Territory of the Pacific Archives. 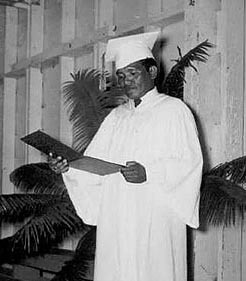 "Alfonso Oiterong of Palau, graduate of Territorial College of Guam, 1959." Oiterong served as acting President of Palau in 1985. Photograph from the Trust Territory of the Pacific Archives. “I think the most important thing that the Americans did is the education in Palau. I think they really did open up the education for Palauan people. So we had young people go out to Guam, other places too for their education, and they established the system of education which at the beginning it was very local. "Then later it changed to be a real American system of education, sort of copy of American system of education. And now I think we are sort of going back in between. Education provided a bridge for Palauans to the ideas and opportunities of the rest of the world. At ground level, in Airai, two other important bridges were put into place.